We’ve all seen a cat . . . right? 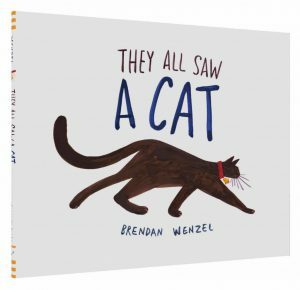 But author/illustrator, Brendan Wenzel, cleverly reminds us in his latest picture book that “seeing” is personal. With incredible art, a bit of science, and lyrical repetition, Wenzel has achieved a timely, visual narrative (a primer, if you will) on perspective-taking – seeing things from another’s viewpoint. The Art – Each page is illustrated in a completely different style. Wenzel doesn’t just tweak perspectives. He creates a new vision of the cat for every creature using marker, pencil, crayon, cut paper and watercolor, acrylic and oil pastel. The Science – Wenzel provides just enough scientific detail in his art to send fact-hungry children on a research quest. The worm, snake and bat pages, in particular, are bound to create a bit of speculation and student questioning. They All Saw a Cat may be a bit confusing, at first, to the youngest children (at least until the fish page!). Younger children are still working to understand that not everyone sees the world in the same way. Perspective-taking is not yet within the realm of their cognitive development. But you can still give them a nudge in the right direction. Have fun reading the book aloud; then ask: Which picture shows the real cat? Their answers may surprise you; but then comes the eye-popper when you tell them that all of the pictures in the book are true – all show the real cat! With older children you can delve a little deeper. This book opens the door to some thought-provoking questions: How do people see the world differently? My view might be right, but does that make your view wrong? How does taking another person’s point of view broaden our own? In these challenging times, our classrooms are ripe for these very important conversations.